Welcome Head Start / Early Head Start Educators! Time to Sign Solutions for Early Childhood provides professional training for childcare providers, teachers and parents of young children, birth to five. We know that the first five years of a child’s life are the most significant when it comes to his/her ability to communicate effectively. 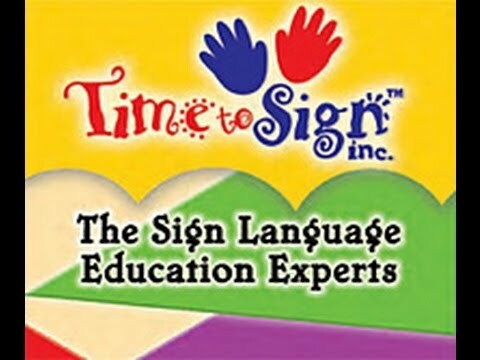 That is why Time to Sign is dedicated to supporting effective and meaningful communication for all by teaching American Sign Language (ASL) in a fun and educational way. Sign to Read – Literacy, Phonics, and Story Telling the Fun Way! Materials and Services can be Provided in Spanish / English / Sign. Call (321) 726-9466 or Email Contact@TimeToSign.com for Details. Feel Free to Check Out Our References! Time to Sign’s extensive training promotes Emotional Support through its Social – Emotional Program (indeed this is Dr. Michael S. Hubler’s area of expertise in which he obtained his Education Doctorate) creating a climate in which children can express their emotions positively and learn to solve many of their own peer interaction issues. Time to sign’s program enhances Cognitive (see benefits at end of document) and Language Development (pre-literacy and literacy skills, and concept understanding and communication). Time to Sign’s Classroom and Behavior Management program provides teachers with strategies, techniques and resources to enhance Classroom Organization to improve children's behavior and time and attention in the classroom. 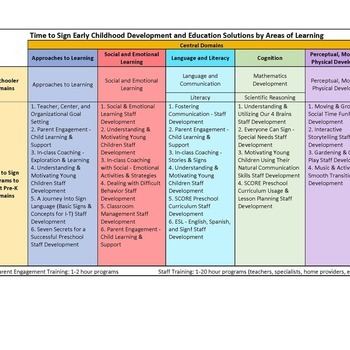 All of Time to Sign’s programs (Social – Emotional learning, Signing Fundamentals, and Classroom and Behavior management) all work together provide teacher’s with a plethora of Instructional Support that enhances young children’s thinking, problem solving and conversational skills, and vocabulary. 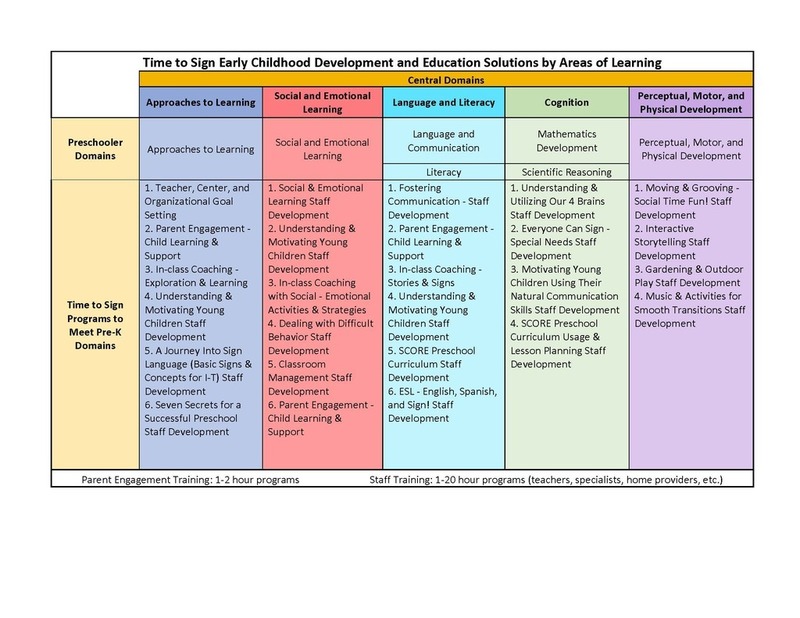 The Time to Sign SCORE daily Lesson Planning Guides help teachers implement standard Head Start curriculum and provide activities with outcomes and indicators for each early childhood area of learning. This presentation will discuss using American Sign Language in the classroom with a focus on promoting a positive educational environment where children can communicate, socialize, and learn effectively. Participants will learn basic communication signs and classroom phrases from birth to five years. The purpose of this workshop is to teach participants how to use sign language daily to compliment learning and enhance young children’s behavior through the use of mnemonics, songs, games, activities, and stories. Attendees will also learn about the benefits of sign language for all children, how to incorporate sign language into their daily routine, as well as strategies and signs for augmenting learning through the visual support of words. This workshop will instruct educators on basic signs for pre-literacy concept understanding and social and emotional development. Participants will learn about children’s social-emotional development, communication languages, establishing routines, picture schedules, visual classroom rules, and how to use music, games that provide a powerful foundation to enhance children’s learning readiness, and pre-literacy concepts. This sign language workshop will teach teachers and specialist methods and practices to enhance their capacity to guide their children in a socially and emotionally journey through a positive, preventative, and effective instructional approach. During this workshop participants also learn to use sign language and other techniques to bring young children out of their emotional brain into their logical brain to enhance self-control, peer relations, and behavior. This segment of the training will instruct educators on basic signs for classroom and behavior management; as well as pre-literacy concept understanding and social and emotional development. Participants will learn common sign phrases for use in controlling the classroom quietly, teaching children self-regulation, and about children’s communication languages, establishing routines, picture schedules, visual classroom rules, and how to use music, games that provide a powerful foundation to enhance children’s learning readiness, and pre-literacy concepts. This sign language workshop will teach teachers and specialist methods and practices to enhance their capacity to enhance behavior and provide teachers with necessary classroom management techniques in sign. During this workshop participants also learn to use sign language and other techniques to bring young children out of their emotional brain into their logical brain to enhance self-control, peer relations, and behavior. This portion of the program will cover children’s ‘Four Brains’ and ‘Communication Languages’. After which this segment will teach participants how to utilize this information to motivate and take advantage of each child’s unique set of personal traits/gifts. The purpose of this workshop is to teach parents how to use sign language as a daily compliment to learning and to improve young children’s communication skills through the use of songs, games, activities, stories. This presentation will discuss using American Sign Language in the classroom with a focus on enhancing language development, concept understanding, and pre-literacy and literacy skills. Participants will learn basic communication signs for children ages birth to five years. Enhancing communication reduces parent and child frustration and strengthens the parent-child bond. Parents will learn how they can add sign language to early childhood in-home learning to enhance concept learning and recall providing a significant boost to young children learning pre-literacy and literacy skills. Parents will also learn about the benefits of sign language for all children, how to incorporate sign language into their daily routine, as well as strategies; and signs for augmenting learning through the visual support of words, colors and animals. Participants will receive: ABC to Animals Poster, Farm Animals Cards, Emotion Cards, and Handout with Activities to Enhance Language, Songs, and Signs to Use with Stories. Benefits of Signing with Children: What the Research Says? Sign language is a 2-sided brain activity that increases brain functioning. It utilizes the right brain for visual learning/recognition, the left side of the brain for cognitive second language usage/storage, it also creates additional connections or synapses in the brain, which in turn creates higher IQ levels in children. It enhances fine motor coordination. It is a visual activity, as 80% of signs are pictorial representations of the represented concept, therefore it is easier for children to learn than the spoken word. It also raises communication awareness and abilities as when signing you have to be looking directly at the person with whom you are speaking. 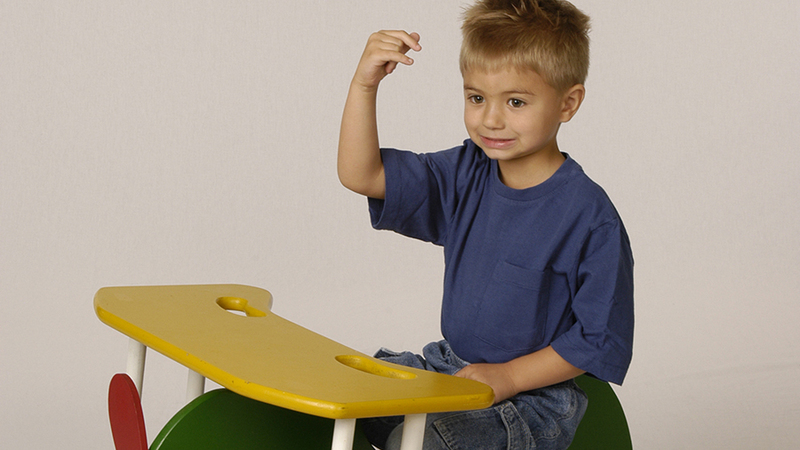 Sign enhances children’s vocabulary, concept understanding, pre-literacy and reading skills. Babies can communicate their pre-verbal wants and needs and be understood, which reduces frustrations and enriches the bond between for caregivers, parents, and children. Sign can also be used reinforce the instruction of the positive expression of emotions, self-regulation, and in the development of social skills. With hyperactive children (ADD, ADHD) sign has been shown to better enable children to self-control, which is the number one skill determining success or failure in life (your superpower).